However, while most business plans address and articulate the product’s or service’s differentiated high value, most assume that nobody else will identify the same needs or that there are few projects, as yet unpublicized, tackling the same opportunity. Few assume that a large number of competitors will build a similar product with similar tools or offer similar value propositions. This is essentially “me too” innovation. In a competitive environment, a lack of value differentiation, which is the most important predictor of success, is almost certain to be a problem. And even worse, if you don’t know enough about your customers, then your definition of value may not match that of the market. Or, you may not be able to identify who is likely to buy quickly with a low sales cost. Value varies by segment and in some cases by individual customer, so the lack of knowledge about a market and customers will send you down the wrong development path. You may offer a product, but the customer wants a service or a solution. You may target the wrong group of buyers. You may offer an inadequate set of benefits. Alternatively, you may over-deliver features, performance and benefits when a simpler product may be easier to understand, purchase and use. With the growth of microprocessor-based products, a proliferation of usage and form factors has led to an inevitable shift between embedded devices, appliances and platforms. Failing to navigate the generational shifts between platforms, appliances and embedded devices has proven to be a major cause of failure or loss of market share. Nokia, a hardware-oriented company that built well-engineered phones (devices), had difficulty matching the email-oriented phones of RIM/BlackBerry. BlackBerry was primarily a service company with devices that offered a great keyboard and a secure email network. The key source of BlackBerry’s differentiation, a closed and proprietary network and a physical keyboard, made it difficult to focus on the idea of the “soft keyboard” needed for a general purpose device and the building of an ecosystem of applications and content availability. Not surprisingly BlackBerry was late to market, because in order to compete with Apple, they had to reject what had made them great. They would have to substitute a soft keyboard for one of their major differentiations – an exceptionally good physical keyboard. And they would have to work with other firms, at the operating-system level (e.g. Android or Windows Phone) and with app developers – all of which pretty much ran against the grain. Nokia primarily sold products. RIM succeeded as a service business with a dedicated piece of hardware; in the future it will likely be more of a service business than a hardware business. Apple built a platform business but, paradoxically, with a consumer-appliance orientation. And as so often happens with a successful digital business, Google went after Apple with an open source set of parity capabilities. In the embedded systems world, there is a common problem: squeezing everything into an embedded system often requires significant trade-offs to meet the small-form factor, performance and battery constraints. These constraints often prevent more open development approaches or use of a more general platform. But when the volume of the general platform becomes high and when the size and form factor match the embedded device’s capabilities, the value and attraction of the proprietary embedded or dedicated device is suddenly devalued. For example, many consumer electronics companies such as Sonos, the vendor of superb wireless music systems, offer proprietary remotes. But they also offer free apps on Android and Apple iOS that are substitutes for the expensive proprietary controllers. In the past a consumer might have bought one proprietary, somewhat expensive controller; it is unlikely they would have bought two unless they had very high income. And over time, formerly primary platform devices (old IOS and Android phones) may migrate to the role of a controller, reducing the market for high-priced, hardware-based custom controllers. The consequence of these generational shifts is that most businesses must either move from a proprietary embedded system to a more platform-oriented solution, or they must package a platform-based solution in such a way as to make it more like an appliance. Note that I say “more” in both cases. The lines between the two strategies are often difficult to see precisely. Apple’s entire business model is based on taking a platform and converting it to what is primarily an appliance approach for the user’s core usage needs. But clearly, the Apple environment does offer incremental value from third-party apps, which is a platform strategy. From the perspective of value and profit capture however, Apple captures most of the value. The majority of apps are little used and unprofitable for the developer. Innovation is more complex today because there is more choice about how to innovate; something I call, tongue in cheek, the “Innovation Smorgasbord.” The idea is that there are many different ways to innovate. Product Innovation: Apple changed the market for smart phones by changing a general-purpose mobile phone into a general-purpose connected device – a hand- held computer with telephone capabilities. Process Innovation: Dell grew its business initially by eliminating the use of a retail distribution channel and building inventory in response to customer orders (a pull system, rather than the more traditional push inventory system). This simpler production cycle lowered costs by minimizing the premature purchase of components whose value declined every day, and by minimizing inventory composition errors, thus enabling Dell to compete on price. Customer Innovation: Google has used its AdWords products to provide highly targeted, direct-response programs that are affordable for small businesses. Though they are obvious, these three types of innovation are not the only ways you can change the relative position of a product. For example, business model innovation is a powerful way of differentiating a product offering. Netflix changed the rules of the game in the video rental business with four important decisions: avoid retail, offer fixed monthly fees with no late fees, use of the U.S. postal service, and recognizing that usage saturation makes fixed pricing possible. The following table illustrates that the options for differentiation are even wider than the basic approaches of business model product, process and customer innovation. Within all, you can pick and choose from a wider menu of business models in most businesses by changing how you monetize the business. The digitization of content has had a profound impact upon numerous businesses – music, movies, TV, traditional books, audio books, newspapers, magazines and newsletters. Many of these businesses have suffered as a result of easier piracy and because the economics of past approaches to monetizing the business have been transformed. Most of these content businesses were sold as physical objects with an assumed set of rights associated with the object. For example, you can typically lend a physical object such as a book, vinyl record or CD, videocassette or DVD to a friend or relative. You can resell the physical object. Heirs can inherit the physical object. Digital content is more flexible. One can consider six potential ways of monetizing the content. And of course, they can be combined. A “buyer” can buy the digital content (though in reality it’s typically a license with restricted rights, not an actual purchase), rent it, subscribe to a service that includes it as part of the offering, and/or obtain it in a way where it is supported by advertising. 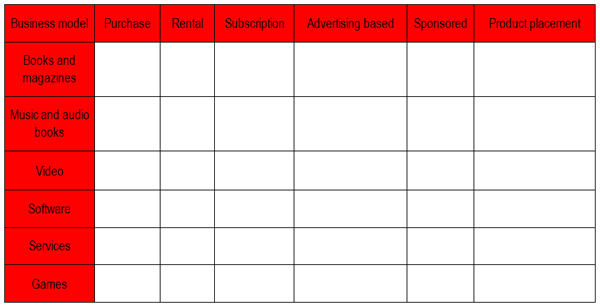 Less often, content can be provided on a sponsored basis. For example, at one point my subscription to the New York Times was sponsored by the Lincoln car, presumably because I had visited the Lincoln site and Ford thought I might be a prospect. It’s also possible to imagine a product-placement monetization model where fees for product placement are a source of income for the content owner. These six methods of monetization can, of course, be combined. The idea of monetizing content in different ways is not particularly new. What is new is that content does not exist in a vacuum in a digital world (at least not since vacuum tubes became unpopular). Other digital rights and services associated with a piece of digital content represent a powerful way of differentiating a piece of content. Consider digital music files (MP3s). Apple launched the first successful online music store: when you purchased a piece of music, you had the right to download it once. If you lost it, it was too bad. If you needed to replace it you had to repurchase it. The music that you purchased was copy protected to reassure the content owners (music companies and artists) that piracy would not be an issue. And Apple restricted the number of devices on which you could play the music. Amazon changed the rules of the game by developing a music store without copy protection. Subsequently, Amazon added a new right, the ability to keep a copy of your purchased music in the cloud. This new right enabled a buyer to both play from the cloud on multiple devices without much in the way of restriction, and for the first time, re-download music from a back-up/master copy in the cloud. Apple, Google and numerous smaller players have now created similar value chains with varying combinations of digital store, music player, streaming and storage. 9. Privacy levels, where there are roughly ten different choices for privacy governance. The unbundling of features and legal rights provides a method of addressing the needs of a buyer with simple needs or a low purchasing power. One could imagine, for example, different prices for a book depending upon the period of ownership, the number of reads, the ability to lend, the ability to resell, the ability to resell and share the revenue with the copyright owner. A more aggressive and innovative legal model might actually enlist readers in the sales process by sharing revenues from referrals or second-hand sales. Bundling adjacent products and services can be used to generate stronger relationships and create new sources of value. For example, one could have different pricing for the purchase of a physical book, an e-book, physical plus e-book, audio book, audio book plus e-book or for access to all three. The proliferation of competitors will often mean that it may be necessary to pick a new combination of activities on the value chain to gain an advantage. This action is common in order to gain and maintain competitive advantage (Porter, Michael: Competitive Advantage, Free Press, 1998). For many high tech companies, this set of decisions will be both uncomfortable and risky, as the new areas of competency and added value are in fact “new.” Many product companies learn that offering a product, particularly when it is perceived as being important and perhaps even “mission critical,” is insufficient. They must take on a service role as Cisco has had to do for its largest and most important customers. In fact over time, what constitutes a product and what constitutes a service will often evolve. The normal progress in business-to-business markets is from customized project to product. For a small firm, this evolution can be a wonderful way of developing a product and minimizing the amount of capital that has to be raised. The risk of this approach for the smaller firm is that a series of projects may not converge on a final scope that can be sold to multiple customers at increasing profitability. 5. Sell the experience rather than the underlying technology, services and staffing that create the experience. For example, when you go to Disneyland, you anticipate and believe you are buying the Disneyland experience (typically primarily for your child) not the various underlying services that create the experience (parking, hotel, reservation system, food services, transportation, customer services, individual interactions with park employees). An experience is more than the sum of its parts, as any visitor to a high-end hotel can attest. Finally, the sheer number of competitors may create more product choice: A company may choose to specialize in a component or very specific function. The advantage of this approach is that the company may spread its development costs over a larger number of users. The strategy is often known as a Gold Rush strategy: “In a gold rush, the people who make money are the people selling the picks and shovels. Few miners will find gold, but every miner needs the tools necessary for exploring for gold.” Iconic jeans from manufacturer Levi Strauss & Co. were born of the California Gold Rush in 1853. Apparently miners need pants as well. The increasing availability of services, components and software from third parties is one of the many reasons why innovation is more successful today than in the past. I learnt lots from this article. Thanks for such articles. 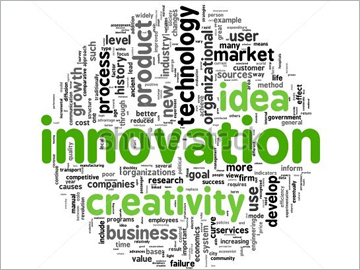 Innovation is the key success in any field of the life. I am an innovator as well as an engineering student, so i know the value of innovation.